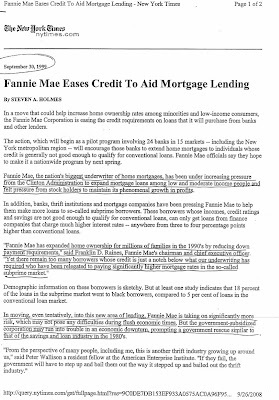 “In moving, even tentatively, into this new era of lending, Fannie Mae is taking on significantly more risk which may not pose any difficulties during economic flush times. But the government subsidized corporate may run into trouble in an economic downtown, prompting a government rescue similar to that of the savings and loan industry in the 1980’s. So to summarize: Stop blaming the Republicans and the Bush Administration for this Banking collapse. Yes, they do share blame in its magnitude, no they DID NOT cause it. Even us independents who don’t know what they believe are also to blame!